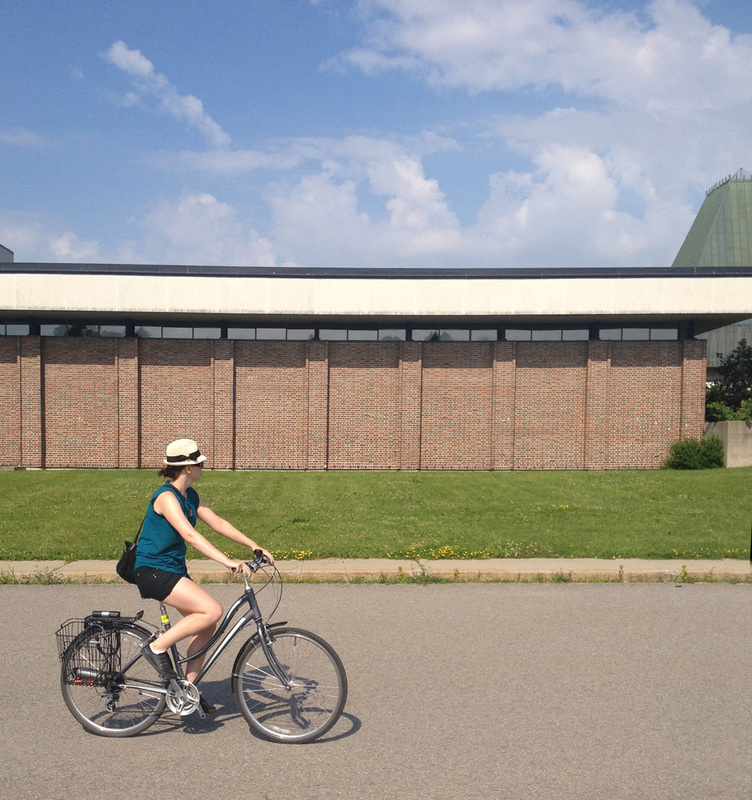 For the second instalment of Architects on Bikes Checking Out Buildings I asked Sarah Gelbard to recommend buildings she admires within our region, and she accepted! Sarah is a graduate of architecture at Carleton, and is heading off to McGill to do her doctorate on Urban Planning in the Fall. She’s very active within the local design community, as evident in her YOWLAB initiative. She’s also one of this year’s organizers of Architecture Week AND she loves to cycle! My architect-sister-Sue had so much fun on our first instalment of Architects on Bikes Checking Out Buildings, she jumped at the occasion to come along for the ride. 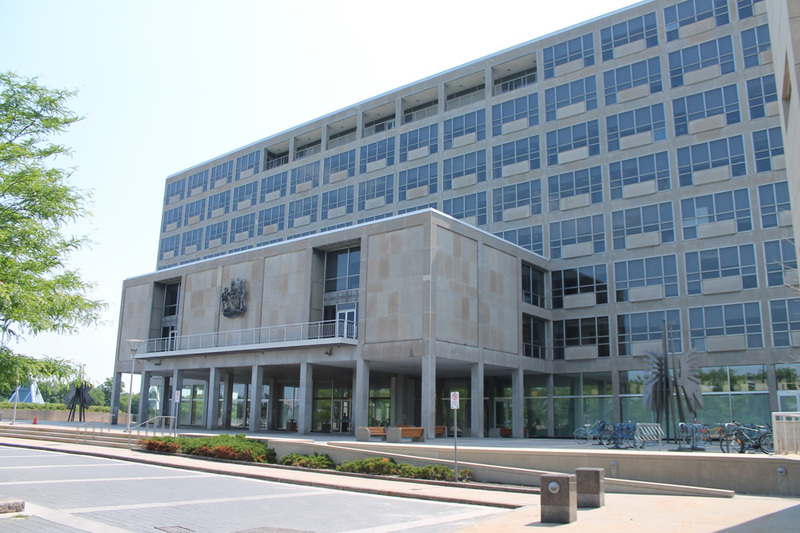 Sarah’s first choice was The Sister’s of Notre Dame campus off Heron Road, while her second choice was The Old City Hall on Sussex Drive. We met up at Art Is In Bakery in City Centre early Saturday morning and headed off. Here’s the route we followed. 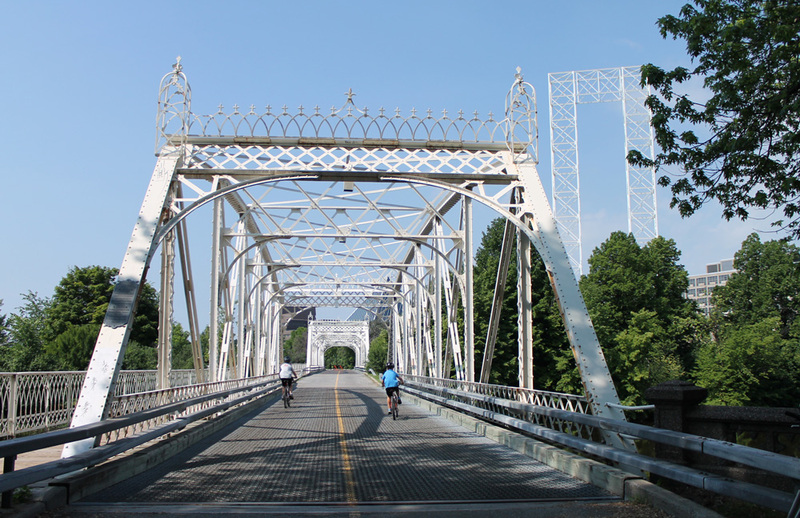 We wove our way south-east along bike paths and quiet streets until we reached the Sister’s of Notre Dame campus. 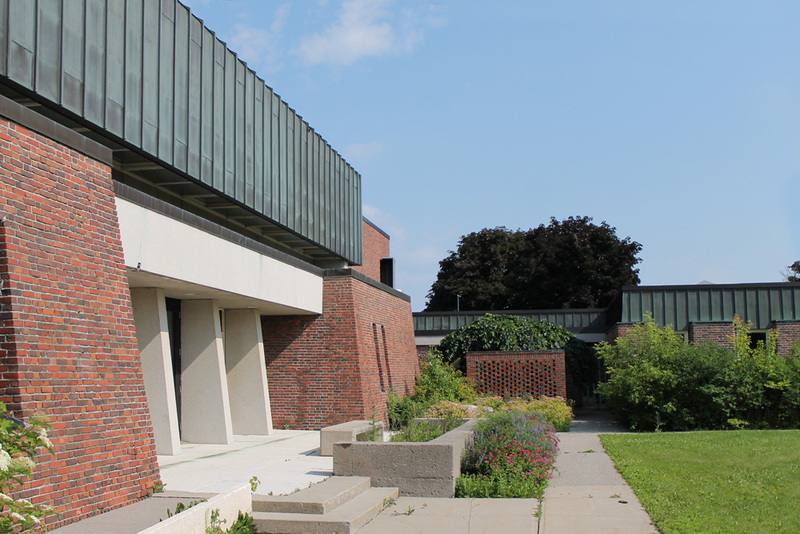 This series of buildings were designed by Tim Murray of Murray and Murray Associates, and completed in 1965 for the Sisters of the Congregation of Notre-Dame. 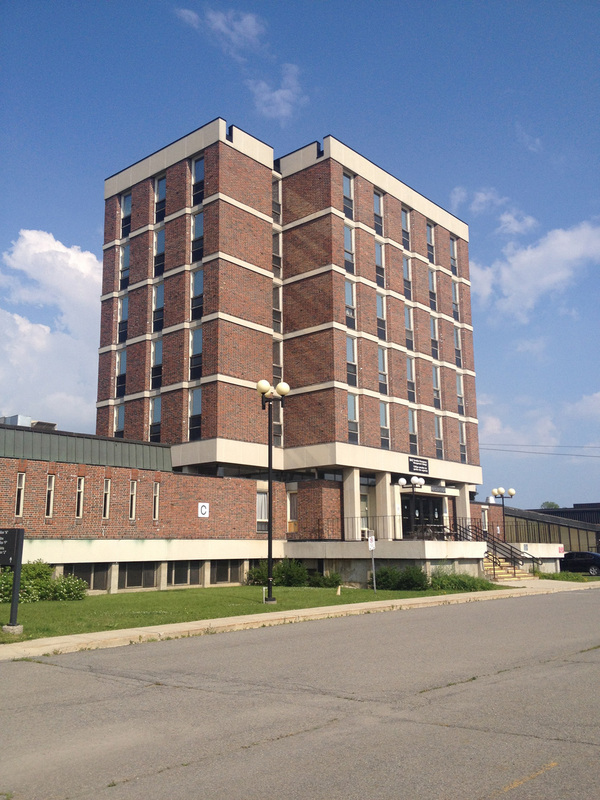 The Sisters operated it as an educational facility up until the 1970’s, at which time it was purchased by Canadian Government and renamed the Federal Study Centre. We were able to meander our way through the campus and admire the various buildings. The brick work was interesting. 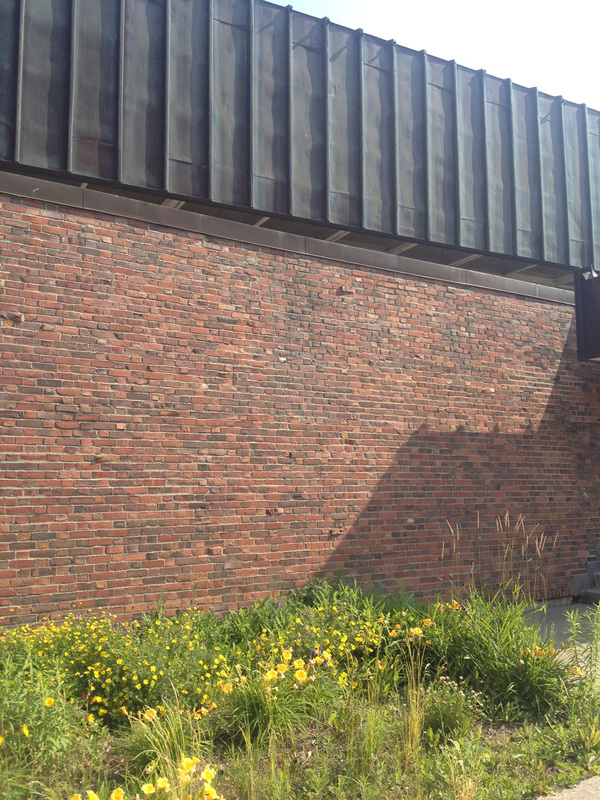 In contrast to smooth glazed finishes popular in the ’60’s when these buildings were constructed, these bricks were roughly poured resulting in wall surfaces of richly varied textures. 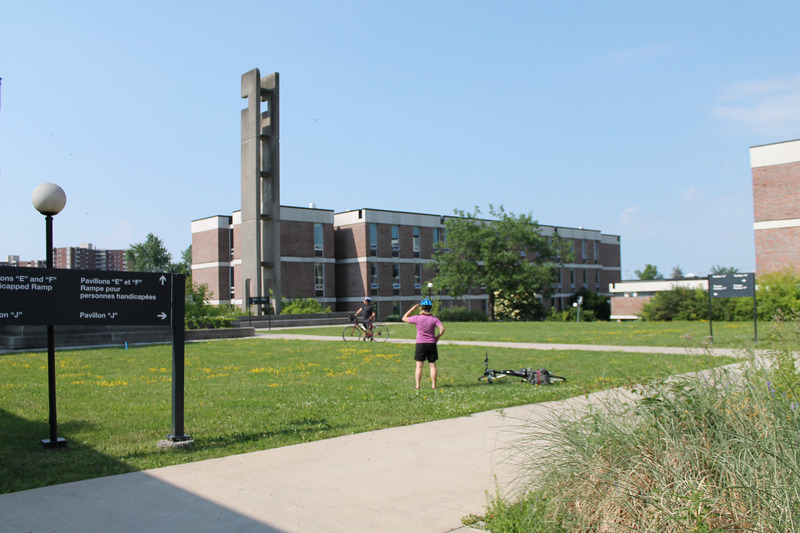 We then worked our way over to Pleasant Park Road, and biked north to the Rideau River Eastern Pathway, which we followed down river all the way to our second destination: The Old City Hall on Sussex Drive. We approached the site from the back, via the Minto Bridge. 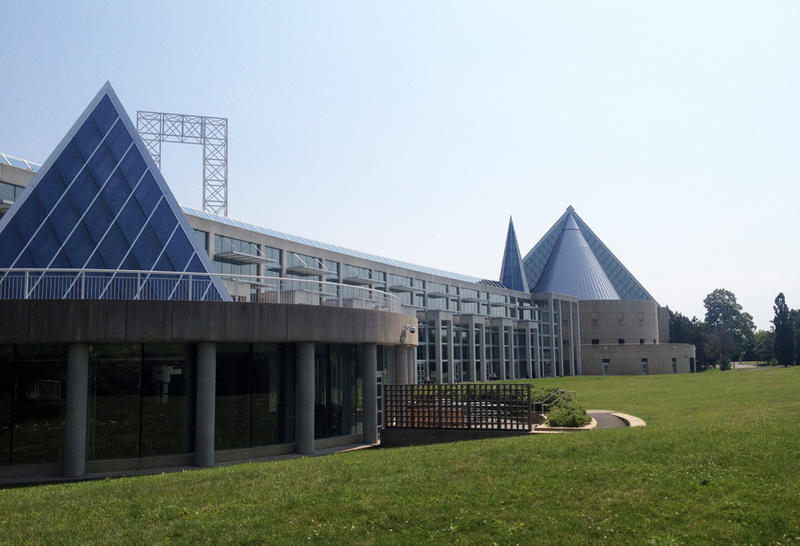 The arch to the right in the photo below was designed by Moshe Safdie and added to the site along with a number of other additions when the original building was expanded upon in 1992-93. 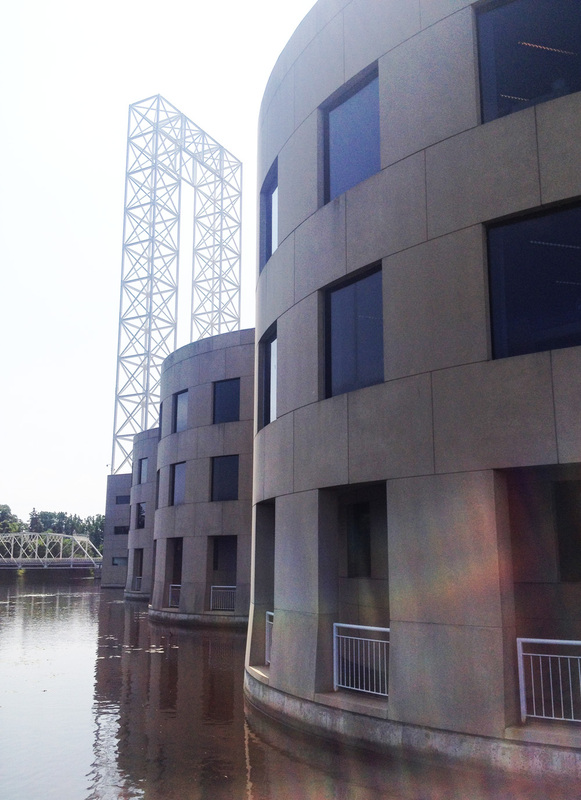 To get to the front of the building on Sussex we rode along the contour of these additions on the northern perimeter of the building, also introduced by Safdie, that bulge out into the Rideau River. I love how they appear to float on the river’s surface. 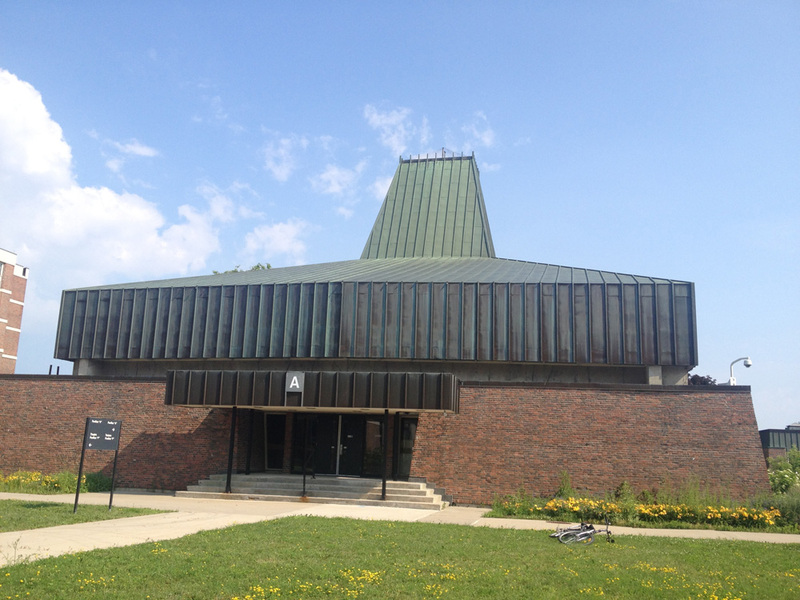 Sarah mentioned being particularly fond of the original building,designed by John Bland of the office of Rother, Bland and Trudeau, 1955-58, as seen in this shot she took of the front facade. She also mentioned a great Urbsite Post that includes original photos of the original building designed in the International Style in 1958, which you can check out by clicking here. We then rode along a path on the south side of the building. There are many wonderful nooks and architectural details to be discovered throughout this site – definitely worth a visit. Architectural exploration complete, we rode back across town for well a deserved break at Raw Sugar Cafe. UPDATE 2017: Hélas, Raw Sugar closed down a couple of years ago. I’ve been slow to come up with my reply post. I promise it will come soon. In the meantime, enjoy Brian’s review of our architecture and bike adventure!